If you’re a coffee drinker, you may be relieved to know that there was an inverse association between caffeine intake and risk of rosacea in a recent study. That was a huge relief for me for sure! Unfortunately, we can’t prescribe caffeine for rosacea and call it a day. So, what works? High-yield pearls on the pathophysiology and management of rosacea are shared by Dr. Adam Friedman – Professor and Interim Chair of Dermatology, Residency Program Director, Director of Translational Research, and Director of the Supportive Oncodermatology Clinic in the Department of Dermatology at The George Washington University School of Medicine & Health Sciences. Here are the highlights. First, let’s talk about diagnosis. Rather than categorizing into 4 classic subtypes that we learned in the textbook, rosacea may be better defined by “phenotypes”. Diagnostic phenotypes include 1) having fixed centrofacial erythema in a characteristic pattern that may periodically intensify or 2) phymatous changes. In the absence of these, the presence of 2 or more major features may be diagnostic, including papules/pustules, flushing, telangiectasia, ocular symptoms. Some secondary phenotypes that may help with diagnosis are burning/stinging, edema, dry appearance, and ocular rosacea. Rosacea in Skin of Color – Rosacea Does Not Discriminate! While rosacea has widely been considered a disorder selectively affecting the Caucasian population, this is not true! Perhaps due to this bias, delayed diagnosis has been reported in substantial numbers. In fact, the prevalence of rosacea in skin of color is as high as 10%! That is significant. Please spread the word! So how do they present differently than Caucasian patients? 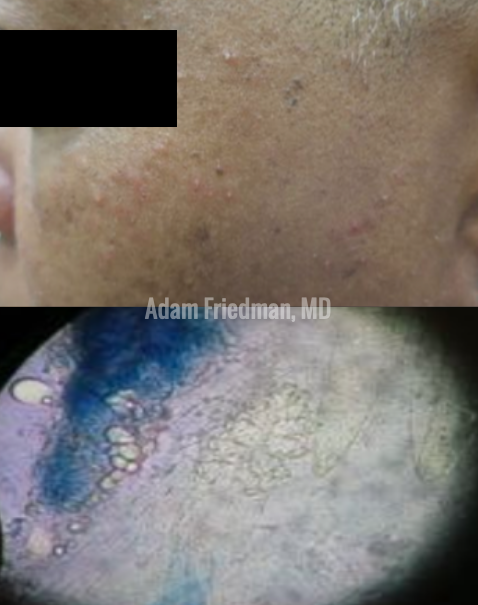 While you may not see the persistent facial erythema (which is common in whites), the granulomatous subtype and papules/pustules are more common in skin of color. Asking about the secondary phenotypes noted above (burning/stinging, edema, dry appearance, and ocular rosacea) may also be helpful in diagnosis. Therapeutic Options – Combo is King! While many prescription treatment options exist (outlined below), patient education concerning proper general skin care is of utmost importance. Make sure to include these in your counseling: daily sunscreen, gentle moisturizers, gentle cleansers, avoid triggers. And here are some practical tips for acute flushing. Try cooling with ice chips in the mouth and oral beta-blocker (propranolol 5mg). Just make sure to check baseline BP and have the patient do a test run! With dysesthesia, try low-dose clonidine (0.05mg BID) or propranolol first. As second line, amitryptiline 10mg daily may be tried. Surprisingly, prophylactic antihistamines may be beneficial as well. 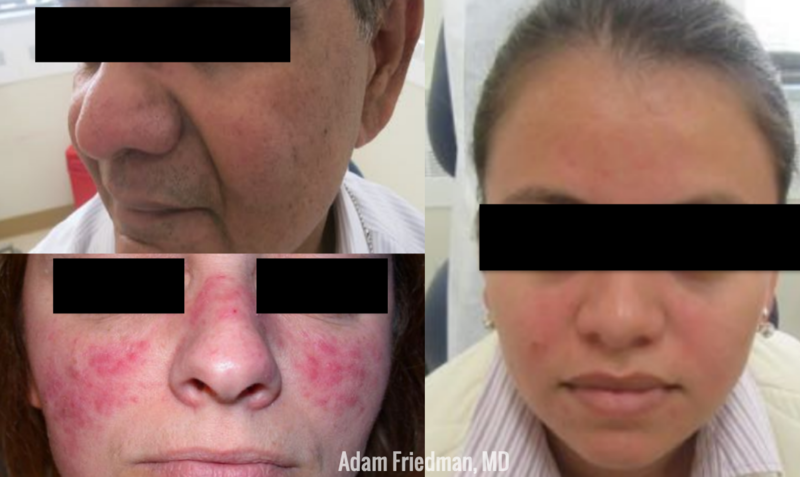 What about low-dose isotretinoin for rosacea? Sure, this can be a great option for recalcitrant cases! A randomized controlled trial showed that 57% of patients who received isotretinoin 0.25mg/kg/day isotretinoin for 4 months had at least 90% reduction in inflammatory lesions, compared to 10.4% who received 10%. But… recurrence can occur. In this study, 58% of patients who responded to isotretinoin relapsed within 4 months after completion of treatment. But those 4 months can be life-changing for severe rosacea patients. What should dermatologists be asking about regarding ocular rosacea? What should dermatologists offer patients with ocular symptoms? Before you get frustrated that your therapy isn’t working or suspect the patient is non-compliant, take a step back and reassess. You may be dealing with something else. One mimicker is Demodex dermatitis, which can be considered a separate condition from rosacea and seborrheic dermatitis. You may see small monomorphic papules and pustules on the cheeks which are intensely pruritic. For this, the treatment includes permethrin and two doses of ivermectin 200ug/kg, 1 week apart. Stay up-to-date on current and emerging therapies and be creative. And good luck! 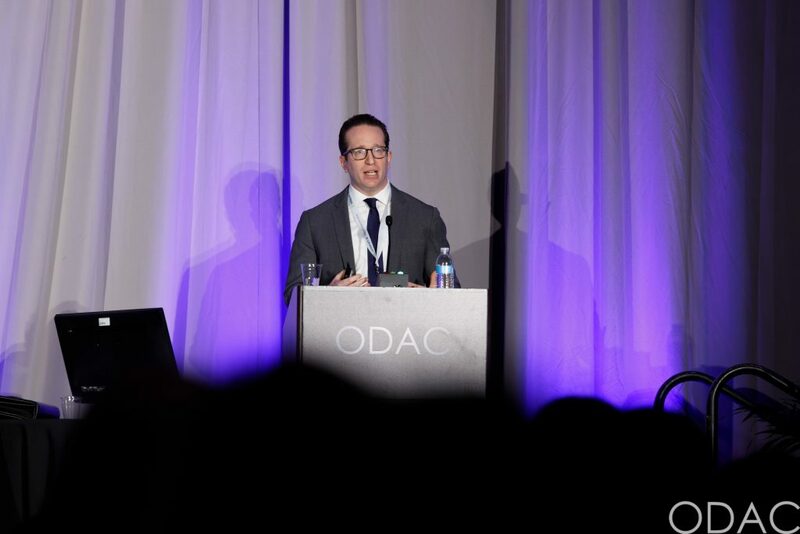 This information was presented by Dr. Adam Friedman at the 16th Annual ODAC Dermatology, Aesthetics and Surgical Conference held January 18th-21st, 2019 in Orlando, FL. The above highlights from his lecture were written and compiled by Dr. InYoung Kim, one of the 5 residents selected to participate in the Sun Resident Career Mentorship Program (a program supported by an educational grant from Sun Pharmaceutical Industries, Inc.). 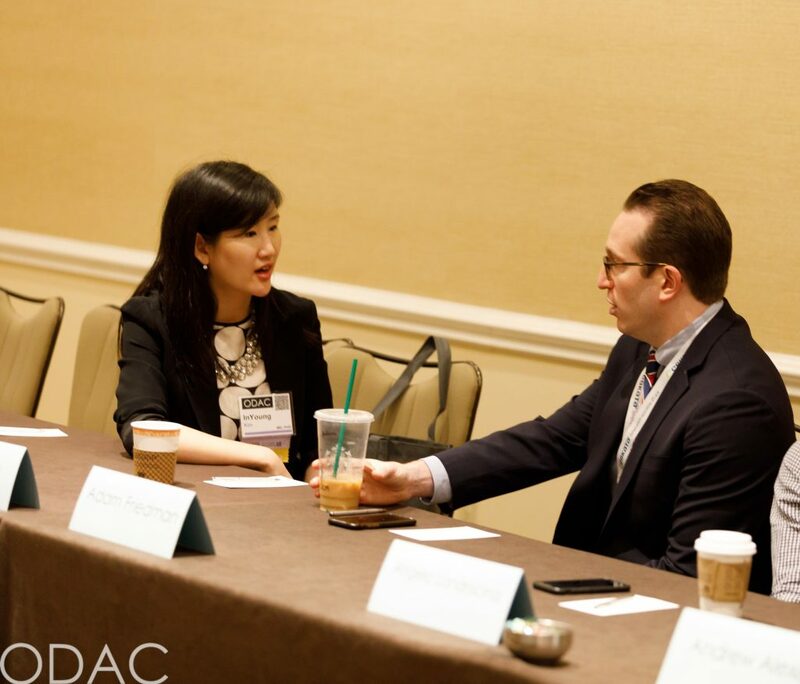 Dr. Kim was paired with Dr. Friedman as her mentor.